Its sidewalk overgrown and doors smashed, the Magnus Butzel Branch Library is glows in the light of the rising sun. In the early 1980's General Motors built a new auto assembly plant on the site of the former Dodge Main plant. Hailed for being the first new plant in Detroit in decades, it was unlike its predecessor. The previous plant was set in a neighborhood, woven into the fabric of the houses and businesses surrounding it. The new plant is a windowless facility set back hundreds of yards from any neighborhood and its employees are mostly suburban commuters. The demand for land to construct it required the relocation of thousands of residents and hundreds of small business in an area known as Poletown after the Polish immigrants who populated it and supplied the labor for Dodge Main. 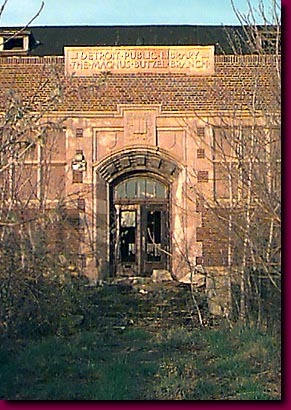 The Magnus Butzel Branch Library serviced that bygone neighborhood.